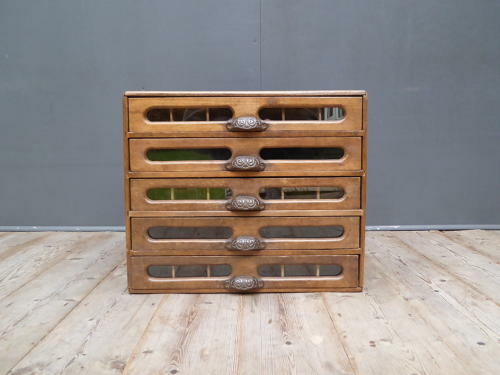 A beautiful bank of antique Parisian haberdashery cotton drawers. A wonderful table top chest of five drawers with glazed fronts & an excellent depth of colour, all retaining their original ornate cast iron cup handles. Three of the five drawers retain their original divisions inside, most of which still have their original numbered paper labels marked 'Le Tubca, Brevette, A.M Paris'. A stunning example. Wear commensurate with age, good unrestored condition & displays beautifully. The cabinet has one small hole back panel, a couple of minor cracks & a little age related movement in the carcass, all pictured & none of which detract. Some of the glass has been historically replaced & all panels are damage free.